The concept was originally born in early 2004, we then invested over a year into research and development. The patent was applied for in the initial stages and after a period of investing over £100,000 into manufacture, design, marketing and legal costs, the product was released onto its first market (Scotland) with amazing results. 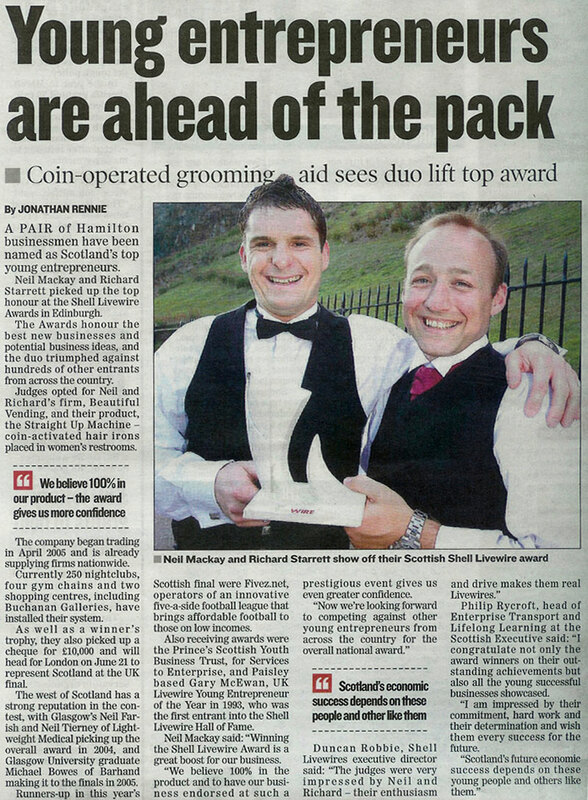 Beautiful Vending Ltd was then incorporated on 16 April 2005 by Richard Starrett and Neil Mackay. Now that the product can be seen in any city or town, the UK and international distributors are emulating the Beautiful Vending success. With a new product and a 2nd Patent Application pending, for all involved with Beautiful Vending the only way is up – Straight Up.